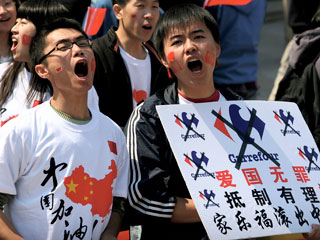 Patriotic Chinese youths are starting to retaliate against the negative international press China has been receiving. A huge hidden army of young patriots are waging a cyber-war against the West. Within days of March's Tibetan riots, the internet was flooded with pro-Chinese videos. Yet this homemade propaganda is only the tip of the iceberg; patriotic computer hacking is on the rise. "Hundreds of millions of Chinese use the Internet, they can contribute to their country as Internet users or as hackers" explains student Wang Tuo. Rao Jin is a 24 year old, trying to defend China's reputation. He runs a Chinese website called Anti-CNN, which aims to expose what he believes is a culture of lies and bias in the Western media. "They report selectively and think that they are superior. It's white supremacy." Whilst computer whiz kid and hacker Yan Zhao, tells of his fellow patriots' willingness to defend and fight for China. "If there is a cyber war between two countries and if our country needs us as cyber citizens or as IT fans...we can certainly protect ourselves." As these hackers become more brazen, Western security experts are growing fearful. Tim Bennett explains why hacking is so powerful, "If you go in through computer networks, you could attack a power grid across an entire country. So for a tiny fraction of the cost...you can do crippling economic and military damage".